Toddlers will certainly be curious and try to understand once they become more aware of their different senses. They go through several sensory experiences that become quite fascinating for them. It is through these experiences that kids eventually improve their grasp of their different senses. With toys like Klickity, a fun element is added into their exploration. Klickity is a sensory toy that provides kids with different ways to discover more about their developing senses. It features a number of sensory elements that kids can discover the more they play with the toy. There are two balls on either side of the toy that provides different sensory effects to kids. There’s a blue ball that, when kids try to push in, will let the pink ball on the other side be pushed out. There are green and purple knobs on the other side of the toy that clicks when kids press them, an effect similar to click pens. There is also an orange ball on top of the toy that spins around and around. Each of the balls and knobs on the Klickity have different textures that kids can explore and understand. The sounds and the movements of the toy elements can provide kids with excitement. 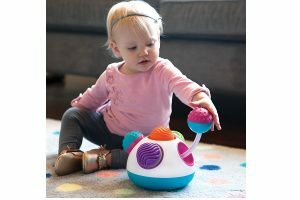 The toy can provide the proper stimuli to help kids discover sounds, colorful sights and touch different textures. Not only that, the toy also helps kids develop their fine motor skills and learn about cause and effect. Klickity is ideal for kids from a year old and above. This is available at Fat Brain Toys for $30.